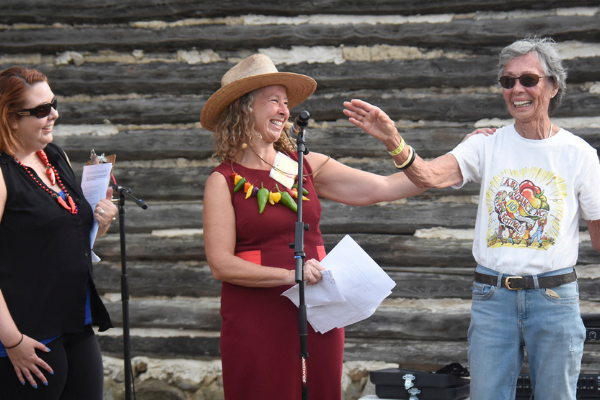 On September 23, 2018, Clairemont client Briar Chapel opened its Great Meadow park to host the 11th Annual Pepper Festival in partnership with Abundance NC. As one of the largest chef competitions in the Triangle, the Pepper Fest challenges top chefs and brewers to craft their most creative recipes using the locally bred and grown North Carolina pepper. This year’s Go Wild theme invited artisans to also showcase foraged ingredients to raise the awareness of North Carolina’s bounty. Festivalgoers sampled a mouthwatering smorgasbord of bites and brews, from spicy mojitos to sweet pepper nut butter. The foodie roster featured culinary cornerstones ranging from Harvest 18, Saint Jacques French Cuisine and City Kitchen to Tribeca Tavern and creative food trucks. Award-winning brewers and distillers, such as Fullsteam, Mystery Brewing, TOPO, Carolina Brewing and Bull City Ciderworks, proffered a menu of zesty beverages, beers and liquor cocktails. And this year, we crowned a new court of foodie winners! Kids played the day away at Pepperpalooza, featuring bubble art, face painting and wacky storytelling. Guests jammed out to all-day bluegrass tunes from Elis Dyson and the Shambles, voted “Best Local Band,” along with ZamBamBooGee. This year’s festival welcomed a record 3,000 festivalgoers! Best of all, the proceeds of the Pepper Fest benefit Abundance NC, a nonprofit dedicated to supporting sustainable food and fuels. We always love a good foodie festival, especially one that helps 200 local farmers who would not otherwise be in business! Want to see some of our other fun work with Briar Chapel? Give it a gander! Blog post originally appeared on BriarChapelNC.com. Cover image from Greg Stewart Photography.